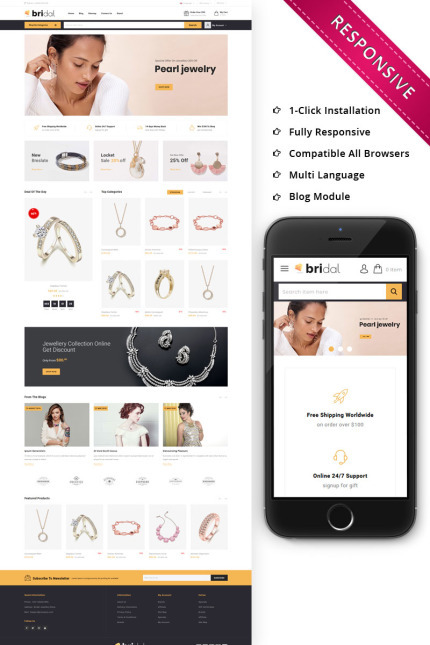 Bridal Online Jewellery Store is a Responsive OpenCart theme. This template is very easy to install as it provide quick start package and easy to customize also. It has features a clean and easy to understand HTML /CSS. This template utilizes jQuery Library, Cloud Zoom, Flex Swipe Slider, and more to contribute to an enjoyable and functionally exhaustive user experience. Among other features Bridal Online Store is also Responsive - the viewport adjusts automatically for all mobile devices, it is SEO friendly and Cross Browser compatible.